This Ultimate Grilling Assortment is all Angus Beef plus Lemon Herb marinated Chicken Breasts. 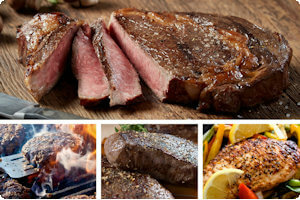 There is a piece of meat for everybody, whether you like burgers, a rich marbled Ribeye or delicate and robust top sirloin steaks. You can grill them, but if the weather is not cooperating, by all means prepare the meat on the stove top and it will be equally delicious and memorable. The hand-cut steaks from from Mid-West raised, Premium Angus USDA Prime beef and are cut by Chicago butchers with five generations of experience.